The Viper was in dire straights against the authority’s ranks, but an old face came to his aid at the last minute. We review the night’s action, the return of Sting to Raw and more. The following results are provided by wwe.com. The Authority opened Raw with egg on their face and revenge on their minds. Mr. Money in the Bank accepted The Apex Predator’s call for a WrestleMania match to settle their score, provided he also went toe-to-toe against Rollins in the main event of Raw. Knowing full-well he’d have to endure a five-on-one beatdown to punch his ticket to Santa Clara, Calif., Orton accepted Mr. Money in the Bank’s caveat with a warning of his own. When the beating did come, he said, The Authority better finish the job, lest Orton complete his own retribution and destroy Rollins entirely at The Show of Shows. Nikki took advantage of AJ’s lengthy stay on the injured list to weaken the former champion’s arm about halfway through their contest. The Black Widow was able to retaliate with a triangle choke and a Thesz Press that put Nikki on her heels. As AJ picked up momentum, however, a spill outside the ring led to a spat between Brie Bella and Paige. AJ took her eyes off a reeling Nikki to tend to Brie and that gave Nikki the opening she needed to hit AJ with a forearm to the face and a Rack Attack for the win. Ryback has made it his personal business to dash superstar hopes for the Battle Royal in brutal fashion. Last night’s target turned out to be The Miz, who has pegged himself the pre-emptive victor of the melee despite a series of embarrassing miscues with his personal assistant, Damien Mizdow. Miz managed to beat Ryback away and convince Mizdow to reconsider attacking him, but his diverted focus got him Meathook Clotheslined and then Shell Shocked into the mat. Seeing as it was Lana who agreed to the bout and not — as Stephanie McMahon decreed — Rusev himself, the bout was more or less null and void before it even happened. All of which would have made for a very short contract signing indeed, had Cena not decided long ago that he wasn’t going to take no for an answer. With Lana mysteriously absent and a Russian lawyer the only protection for the champion, Cena was handed an ultimatum by Rusev. He’d get the match, provided Rusev was allowed to read his latest anti-American manifesto uninterrupted. Cena took Rusev’s abuse stoically, put pen to paper and the match was made. With The New Day and Los Matadores having come out of nowhere as potential contenders to the WWE Tag Team Titles, reigning champs Cesaro & Tyson Kidd needed a near-perfect outing to preserve their momentum. They got their chance, beating The New Day’s Big E & Kofi Kingston to ensure a strong standing heading to WrestleMania. The latest bout between the two was a note-for-note reprisal of their SmackDown bout a few weeks ago, with Show swarming Rowan right out of the gate. Big Show KO Punched him and added a new wrinkle with a sternum-steamrolling elbow from the second rope. This week, nearly every announced competitor — Kane, Jack Swagger, Goldust, The Prime Time Players, Zack Ryder, Adam Rose, Heath Slater and the recently returned Mark Henry — in the Andre the Giant Memorial Battle Royal came down to the ring to stand face to face. Paul Heyman’s newest speech brought Reigns himself to the ring with his latest mantra emblazoned across his chest and fire in his belly as he sent a message to Lesnar that, despite whatever Heyman says, he can and will dethrone The Beast Incarnate at WrestleMania. Next week, Reigns will have the chance to say it to Brock Lesnar’s face. With Daniel Bryan’s name added, the seven-man Ladder Match for the IC title has become one of the most must-see contests of WrestleMania 31. In advance of the match, six of the competitors involved teamed up for a Six-Man rumble on Raw, while the seventh, R-Truth, took up his now-customary post at the commentary table with the ill-gotten Intercontinental Title clamped onto his back. A common goal made enemies out of supposed teammates early on. Despite a strong opening, tensions rose quickly between Bryan, Dolph Ziggler & Dean Ambrose, though the three still managed to put their squabbles aside to stop a furious rally by the ne’er-do-well trio of Bad News Barrett, Luke Harper & Stardust. Even though Ziggler accidentally superkicked Bryan on the apron, Ambrose picked up the slack by reversing Barrett’s Bull Hammer into Dirty Deeds for the three. Of course, it wasn’t long before Truth’s deception was uncovered and yet another brawl erupted over the title, the upshot of which was Barrett Bull Hammering everyone in sight and finally getting his Intercontinental Championship back. 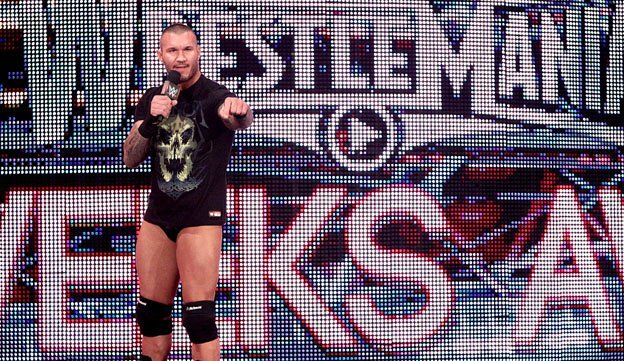 True to Randy Orton’s prediction, the squabbles between the infighting Authority turned out to be little more than a ruse to lull Orton into a false sense of security before his match against Seth Rollins. No sooner had Rollins made his entrance than the corporate crew reformed and closed ranks around Mr. Money in the Bank, leaving The Viper thoroughly outfoxed. What happened next, however, really was surprising. Before Orton could be sent packing to the emergency room, the lights cut out and Sting came to the aid of Randy Orton, clubbing Kane with the baseball bat and Stinger Splashing J&J Security before dispatching Noble with the Scorpion Death Drop. Orton followed suit with an RKO to Joey Mercury, and The Authority, duly rebuked, backed off from the scorpion-snake tandem. Unfortunately for Rollins, his WrestleMania fate may already be sealed anyway.